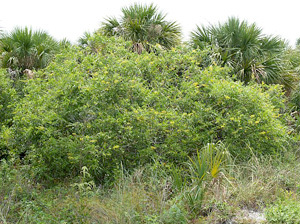 General Landscape Uses: Accent or specimen shrub along the coast. Also buffer plantings. 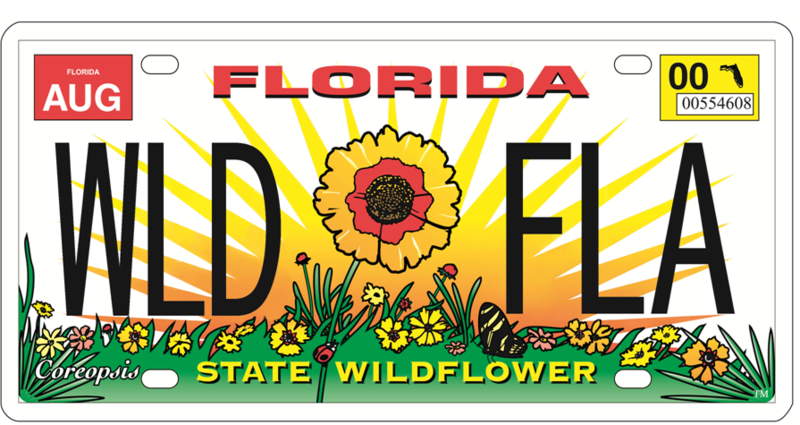 Availability: Grown by a few native plant nurseries in south and central Florioda. 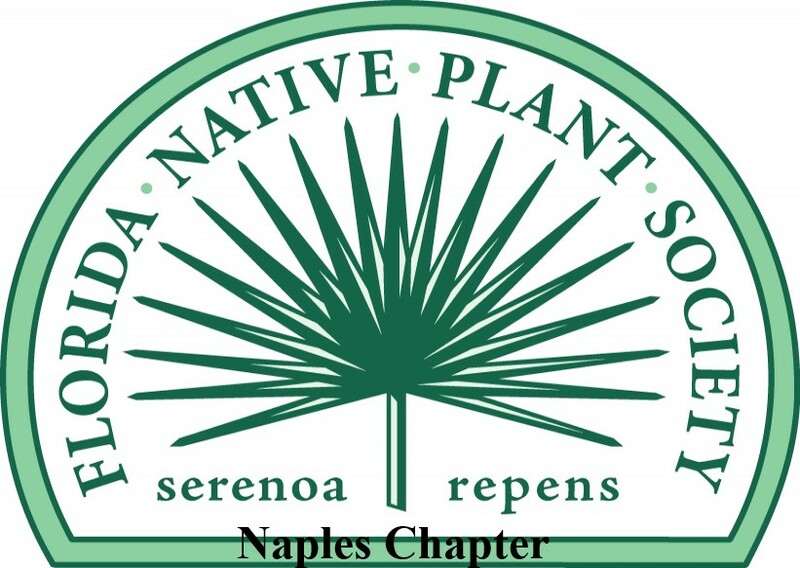 Available in Lake Worth at Indian Trails Native Nursery (561-641-9488) and at Amelia's SmartyPlants (561-540-6296). 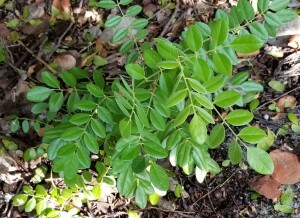 Description: Medium to large shrub with an irregular rounded crown. Trunks short, bearing several arching stems. Bark yellowish-brown, roughend by lenticels. 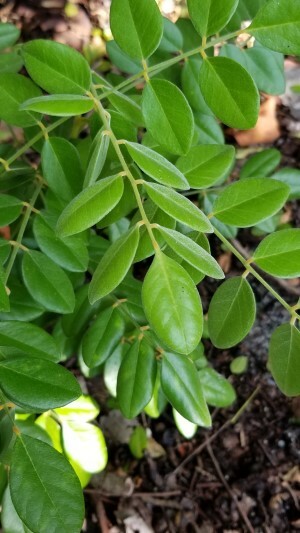 Leaves glossy dark green, shiny above, slighly hairy when young then becoming glabrous. Dimensions: Typically 8-10 feet in height. About as broad as tall. Range: Monroe County Keys north to Brevard and Levy counties; Mexico, Central America and South America. Habitats: Edges of coastal forests and thickets. Soils: Moist, well-drained sandy or limestone soils, with humusy top layer; rarely on peat on tree islands in the southern Everglades. Flower Characteristics: Showy, in long, racemose, terminal spikes. 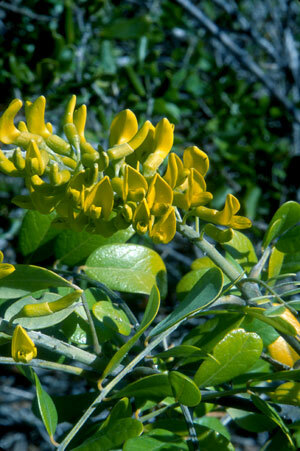 Fruit: Yellowish-brown beaded pods (legumes), 2-6" long. Wildlife and Ecology: Provides food and shelter for wildlife. Nectar plant for hummingbirds and butterflies. The flowers also attract warblers and bees. Horticultural Notes: Can be grown from seed. Care must now be taken to avoid pollination by S. tomentosa var. occidentalis (see below). Comments: The very hairy, commonly sold necklacepod is S. tomentosa var. occidentalis from the West Indies. 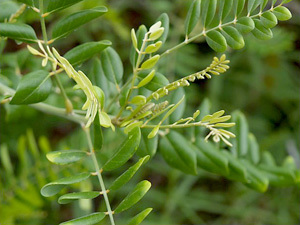 The seeds are toxic if eaten.